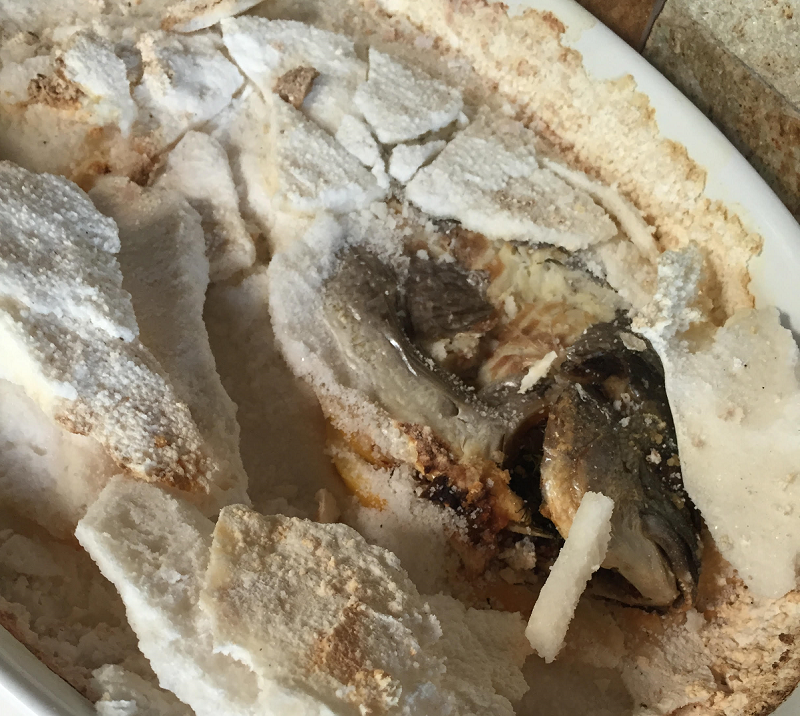 The first dish I want to present in my blog is ..my fish, cooked in salt. This is a very easy and quick recipe, but it’s very attractive and last but not least, healthy. So, invite for dinner someone you really value and cook him/her this dish. You can prepare as a side dish a salad of some sort or something else. 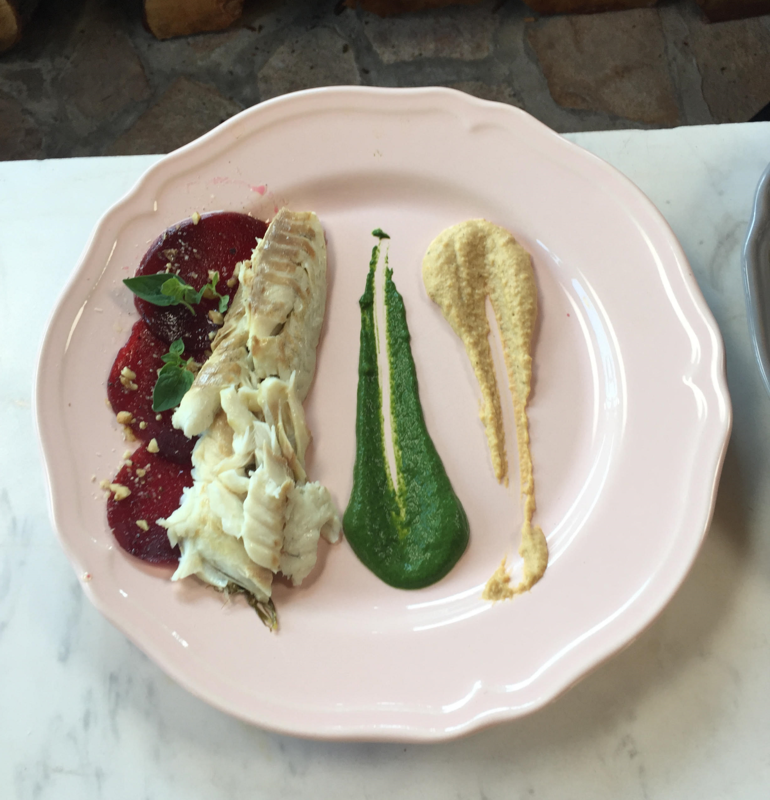 My choice was a cream made of spinach, humus and marinated beet. Cut the fennel in fairly thin slices, then cut one of the lemons in 4 quarters. Take the first sea bream, put some salt inside it, add a few slides of fennel and 1-2 pieces of lemon. Repeat with the second sea bream. Put the salt into a big bowl and add water until the mixture starts looking like snow, when you stir it. Take a suitable cooking pan and put a layer of this snowy mixture. If you want to add aroma, sprinkle the layer with some herbs. Put the two sea breams and cover them with the rest of the salt. Make sure that the salt does not go inside the fish. Leave part of their heads uncovered. Bake in the over on 180 degrees for 20-30 minutes or until the salt stars getting brown on the ends. Now is the time to prepare the cream. Mix the olive oil, the pinch of Himalayan salt and the lemon juice. Put the beet inside, sliced in very thin slices. Leave this aside. To make the humus mix in a blender the chickpeas, the red peppers cut into pieces, the parsley, the cumin, the garlic and 10 tablespoons of olive oil. Add salt according to your taste. Blend everything to a homogeneous mixture and add some lemon juice. Blend again. Now, it’s the time to make the spinach cream. Let the spinach steam for a while, then take it out and add the sour cream. Put some salt and blend until you end up with a smooth mixture. After you are ready with all these side dishes, it’s time to serve the sea bream. Help yourself with a kitchen hammer to break the crust of the fish. Don’t hammer too strong – you may smash the fish. Take the fish out from the salt – if they got cooked well, their skin will easily peel off. Remove the main bone and put into the plates for serving the dish. Add some humus, the chickpeas, the beet…it’s super delicious, isn’t it? Enjoy the unique aroma and taste and … be happy, that you fed yourself with something really good and healthy for your body. Tip: Soak the chickpeas into water from the day before. Thus you will only need 15 minutes to boil it.